Now you can dig deeper into ideas with new, original books from TED. Long enough to explore a powerful idea but short enough to read in a single sitting, TED Books pick up where TED Talks leave off. This wide-ranging series will cover everything from architecture to business, space travel to love. The idea was deceptively simple: A.J. Jacobs would thank every single person who had a role (however small) in producing his morning cup of coffee. In today's frenzied and wired world, we are obsessed with the idea of not "wasting time." But have we lost the silences and solitude so essential to our inner lives? Join world-renowned paleontologist Dr. Kenneth Lacovara on a remarkable journey––back to when dinosaurs roamed the Earth––to discover fundamental truths about our own humanity. Chances are you probably have a pretty fixed idea of what makes you, you. But what if your personality was flexible, and ultimately in your control? TED Books are now available in four specially curated collections: The Completist, The Science Mind, The Creative Mind, and The Business Mind. These beautiful box sets are designed to let readers dive deeply into their favorite topics. An 18-minute speech can plant a seed or spark the imagination; but many talks create a need to dig deeper, to learn more, to tell a longer story. TED Books fills this need. 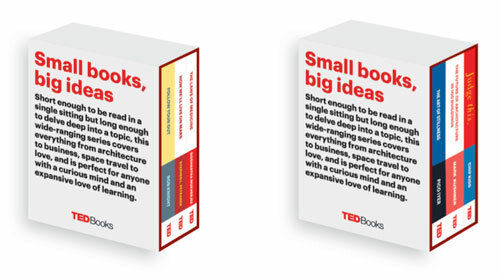 In September 2014, we published the first TED Book in print. Have questions? Email us at tedbooks@ted.com. For anyone who has ever been inspired by a TED Talk... this is an insider’s guide to creating talks that are unforgettable.